Fiddlesticks – My crochet and knitting ramblings. : Pun-kins!! Fiddlesticks – My crochet and knitting ramblings. : Pun-kins!!. Dawn over at Fiddlesticks posted a link to a free pumpkin crochet pattern she found. Her pumpkins are adorable! Head on over and check out her site and all her crafty creativity. Then, go download the pattern. Categories: Beth's Crafty Things | Tags: crochet, fiddlesticks, patterns | Permalink. OK. I actually finished this a week ago, but have not had time to post it. 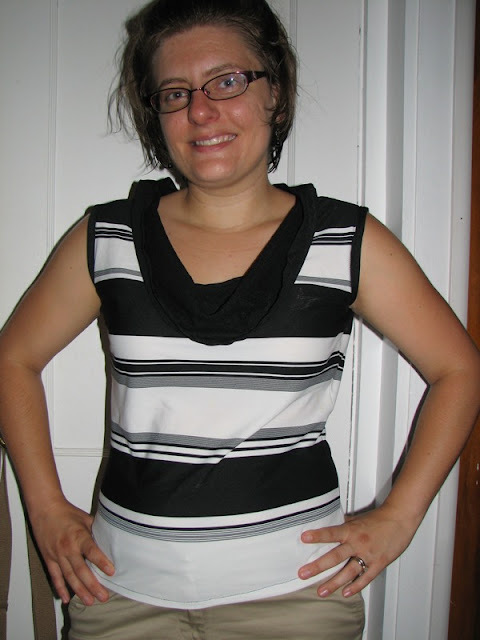 I used the same BurdaStyle pattern as this shirt, but used the version that adds a cowl neck. The Sadie has a nice fit to it, I think. It’s a little snug, but I like it. I could go up another size, but then I think it would be too large. This material is from the stash Nannie gave to me. I did not cut it so that the material would stretch from seam to seam (which would be the correct way) because I wanted the stripes to be horizontal. Getting the shirt on, therefore, is a little tough, but not impossible. I had plenty of material, so the neck and arm bindings are made from the same material, making them softer and lay better than my first Sadie tank top. (You can’t see the neck binding as it’s behind the cowl neckline. I didn’t like the shirt at first. I thought maybe it was too tight or didn’t look like a good fit. But after I wore it for a day, I really fell in love with it! Categories: Beth's Crafty Things | Tags: BurdaStyle, fabric, patterns, Sadie, sewing, shirts, tank top | Permalink. So I bought an iPad and now I’m looking for a way to keep the screen protected. I could buy a cover, but I’m thinking I could save money by making one. Plus, I’m sure I could make one much more attractive looking than the ones currently offered through Apple. Jennifer over at CraftSanity has made a really neat one for her husband. If I were to make it though, I would probably try to figure out a way to add a plastic screen cover. Other bloggers have great tutorials too: Dixie Mango, One Shabby Chick and Craft Gossip. I will probably try and make one using fabric I have on hand, though I haven’t ruled out making a run to the store. I may have to stop by a fabric store if I plan to make a cover with a plastic window. What are your thoughts? Any suggestions? Is fleece or cotton material with interfacing sturdy enough or should I opt for upholestry fabric? Color schemes? Categories: Beth's Crafty Things | Tags: iPad, patterns, projects, sewing | Permalink. It’s finished! I completed the embroidery on my polo-to-tank-top shirt on Friday evening. Not too bad for an old men’s polo shirt, huh? Haa, haaa! I like this picture of me scratching my head. I really don’t like having my picture taken. Blah! This is probably the best “normal” shot Chris took. You can read more about the changes I did to the top here. I used BurdaStyle’s Sadie pattern. Here’s a close-up on the stitching around the collar. The spot on my neck is actually in the camera. We thought it was the lens, but it’s actually on the mirror or something else in the camera. Can’t seem to get rid of it. I used a decorative stitch on my old Singer called “Sephora.” What do you think? The embroidery pattern comes from Jenny Hart of Sublime Stitching. I used her “Sublime Stitching: Hundreds of Hip Embroidery Patterns and How-to ” book. I love how the embroidery thread matches the collar and sleeve thread! Categories: Beth's Crafty Things | Tags: BurdaStyle, embroidery, Jenny Hart, patterns, refashion, Sadie, sewing, shirts, Sublime Stitching, tank top | Permalink. Hiya! Just a quick reminder to stop by Grosgrain to enjoy Free Pattern Month through the end of May. Click the button below! Also, Rae over at Made by Rae is hosting her annual Spring Top Sewalong. Submissions should already be in and judges will soon narrow down the tops down to the finalists, which we’ll get to vote for our favorite. One of the judges, Deborah of Whipstitch Fabrics, shared how to buy fabric from online stores earlier this week. If you’re anxious about buying fabric online, stop by Whipstitch Fabrics to see what Deborah says about picking out the best fabric for your project. Categories: Beth's Crafty Things | Tags: fabrics, free, grosgrain, Made By Rae, patterns, shopping, Whipstitch Fabrics | Permalink. I’m calling this shirt The Margie after my mother-in-law. She gave me the material with a turtle-neck dress pattern that she never started. I think the fabric worked perfectly for this project! It really didn’t take that long to finish the shirt, but I didn’t get down to the sewing room for a few weeks and it’s taken more than a week to get this post up. So, what do you think? I still had a little trouble with the neckband, but I figured it out after talking with my mom and grandma and looking at the pattern instructions again. It’s not perfect because there’s pinches of fabric here and there, but I really love how it turned out. It’s still been cool enough to wear this shirt and it’s thin, so it’s perfect for a cool spring day. I’m so proud and happy when I’m wearing it! I don’t know why I waited so long to work with a knit! I’ve always heard that knits are super hard and you should get comfortable with woven material before tackling this type of project. Phooey, I say! This was so easy. It did take awhile to figure out how to put on the neck band, but the rest of it was easy-peasy. I can’t wait to tackle my next knit! Also, though it’s sacrilege, I also cut out this pattern instead of tracing. I usually insist on tracing patterns so that they will last longer, but I was impatient to get sewing. I don’t know why I make a big deal to save the pattern papers whenever women’s styles change so much. If I limit the use of pins, it should help the patterns last just as long as it would otherwise, right? I’d much rather spend what little time I have sewing, not tracing. So, I think my days of tracing maybe over. I’ll hold onto the tracing paper to make my own patterns and for drafting, if I ever progress to that level of seamstress. Categories: Beth's Crafty Things | Tags: blind hems, knits, Kwik Sew, patterns, sewing, shirts, The Margie | Permalink. Grosgrain’s Free Pattern Month starts Monday! Kathleen over at Grosgrain announced this morning that Free Pattern Month begins Monday! The event coincides with Kathleen’s announcement of changes taking place at Grosgrain. You can read about those changes here. Click on the button below to go visit. I’ll also post this button on my page so you can easily find it in the future. Categories: Beth's Crafty Things | Tags: free, grosgrain, patterns, sewing | Permalink.